Teide National Park covers the two large stratovolcanoes of Teide and Pico Viejo, Las Cañadas Caldera and many other volcanic features. Compared to other volcanic landscapes on the list, this NP stands out in size, complexity, age, depth of study and ongoing relevance to science. At 3,718 m above sea level, Teide volcano is the third highest volcano in the world and the highest mountain in Spain. The site lies on the Canary Island of Tenerife, in the Atlantic Ocean. Due to its eruptive history (last in 1909) and location close to population centres, the volcano has been designated worthy of close study to prevent future natural disasters. 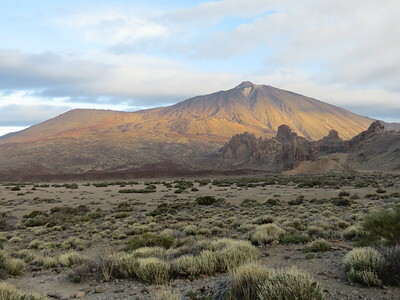 It is a major centre for international research with a long history of influence on geology and geomorphology especially through the work of von Humboldt, von Buch and Lyell which has made Mount Teide a significant site in the history of volcanology. When I told my colleagues that I would be visiting Tenerife during the New Year’s holiday, they thought that I finally had succumbed to a relaxing beach vacation. They were surprised to hear that it would put me within reach of 3 WHS. 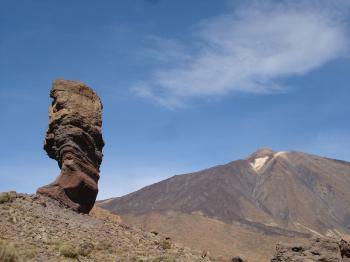 Those that had been to Tenerife themselves all offered “El Teide” as the island’s most likely WH candidate. The Teide WHS is a volcanic landscape that actually covers two peaks (Pico Viejo and Teide), of which the latter is the most iconic. I already enjoyed good views of it from the plane while approaching Tenerife Norte Airport, and from the top of the Garajonay on La Gomera. Teide NP is part of our infamous “One million visitors or more”- connection. Visitor numbers have actually been dwindling over the past 5 years (due to the economic crisis?). Still it can get very busy up there, and I used Hubert’s excellent advice how early to start out. I left my hotel in Granadilla at 7.30 a.m. When I arrived at the park some 45 minutes later, it was almost freezing cold (+2.5 Celsius) but I had the place to myself. Just wonderful. I stopped at a few Miradores, watching the sun rise. Comparisons to the moon have been made, but the landscape looked more like Southwestern USA to me. It’s not that barren: tough plants cover large parts of the ground. The most prominent spot here at the southern side of the park is the Roques de Garcia. This is a series of strangely shaped rocks, the erosional remnants of an earlier version of the volcano. There’s a 3.5 km long trail that loops around them. Although the temperature left me with very cold hands, I opted to do this medium level hike and see the rocks up and close. The path starts out easy, but gets more tricky half-way. You actually walk along the back-side of the rocks. I even got lost a bit, I was starting to scramble up a hill when I saw 2 people approaching from the other side showing the right path. The real climb is left to the end, a switchback trail all the way up to the main viewpoint again. That trail is where I got the best views, including that of the photo right above. After the hike I drove down the road that cross-sects the park. There are a couple more viewpoints, but none I found as spectacular as the Roques. I already had decided beforehand to forego on the cable car ride to the top. The visitor center “El Portillo” at the northern end of the park turned out to be closed on January 1st. It was free to enter the attached botanical gardens though, where I was immediately attracted to another view of the Teide. Teide NP entered the WH List in 2007, at the same session as Korea’s Jeju Island. This sparked a debate if there weren’t enough volcanoes on the list already (“including several properties whose inscription was justified on the basis of arguments that are considered by a number of experts to be rather narrow”). The Committee requested IUCN to do a Thematic Study. The results were publicized in 2009: although most types of volcanic features were considered well-represented, some gaps were still identified. Since 2009 several new volcanic sites have been added to the List (Pitons of Réunion, Ogasawara Islands, Mt. Etna and Mt. Fuji for example) - not the ones that would fill any lacunes. And although the IUCN study does criticize the “the haphazard process of site selection and nomination of World Heritage properties by State Parties”, it doesn’t dare to say which of the already inscribed ones are superfluous. 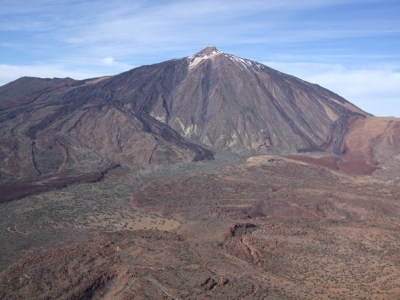 No doubt has ever been casted about El Teide: its height, age (over 3.5 million years) and gigantic caldera (a term that originated here) justify its inscription. I visited Tenerife in January 2011. I have great memmories on it, because it was a special trip when me and my friend crossed a half of the island by walk overnighting in the wild nature. I am pretty sure that it was not completely legal in National Park. I am also sure that it will never happen to me again, because I am getting older prefering hotels and not prefering heavy backpacks anymore... So, it was a unique experience in all aspects. We walked from Vilaflor located near the southern edge of Teide caldera. It was for the first time I was in the vulcanic landscape, and I cannot describe properly how I felt when have been climbing Guajara mountain, seeing Teide mountain and the entire caldera for the first time. We refused using "teleferico" to reach the summit of Teide and walked towards Refugio de Altavista, where we have pre-booked an accommodation by phone. We could not climbed the peak because of ice plates that might be dangerous. Then, we walked to the east to Cumbre Dorsal mountain range. What I loved was all the contrasts: blue sky vs. black basalt rocks such as Huevos del Teide vs. ochre or red soil; sunny days vs. freeze of night; Moon-like landscape vs. green pine forests outside the caldera vs. blue ocean. Furthermore, the color shades of rocks within the caldera changed during the day. To conclude: Teide National Park embodies one of the most beautiful landscape I have ever seen. We visited Teide National Park for two days in the autumn. The first day we went to the 'Roques de Garcia', already mentioned in Els' and Hubert's reviews. We can confirm that during the 3.5km walk, at some points it's easy to lose track of the path. Just keep looking for the small 'stone towers' which indicate the correct way. The second day we got up early to climb Mount Teide. The best way to do this is to start from the small parking located around kilometer 40 on road TF-21. The trail is about 9km (one way) and first leads you along Montaña Blanca and the impressive 'Huevos del Teide' (lava 'cannonballs' from the eruption of the vulcano). After some time you will reach the base of Mount Teide. When we visited, the whole track (from the start) was covered with snow which made the way up Mount Teide somewhat difficult. The trail ends at 'La Rambleta' at about 3.500m, which is also the place where you will arrive if you make use of the cable car. For the last 200-300m to the top, you need a permit. We disposed of such permit (it can be requested online and is free of charge) but because of the snow the summit was closed. However, even from La Rambleta the view is stunning - on the picture you can see Pico Viejo and the island of La Gomera. As mentioned below, note that at 3.500m it's much colder than at sea level and that some people can start experiencing altitude sickness. In November 2007, we spent one week on Tenerife to escape the cold weather in Austria. We visited the Mount Teide National Park as a day trip from our accommodation at the south-west coast. We started early in the morning (at 7am) with our rental car in order to avoid the large tour buses, which start between 8 and 9 am from all major tourist centres. Another reason to get up early is that in the morning the air is clearer and the view is better, in the afternoon the Teide summit could often be hidden by clouds. We took the road via Guia de Isora and arrived at the National Park after about 1.5 hours. The route is very interesting, you drive from sea level to 2,300 meters through different vegetation zones. First everything is green and colourful, we drove through banana plantations, followed by pine forests, and finally we arrived at the caldera Las Canadas, where rocks and solidified lava flows predominate. It reminded me of pictures from the Moon or Mars. Early in the morning we were almost alone on the road, so that we could stop everywhere to look around and to take pictures. The most popular and most spectacular viewing point is the Roques de Garcia, opposite are a Hotel Parador and an information centre. The Roques are bizarre, unique rock formations. Plenty of needle-shaped rocks of different colours stand one after another at a length of several hundred meters. The rocks consist of different layers from various eruptions. And you have a beautiful view over the caldera with Mount Teide in the background (photo: Roque Chinchado). Starting at the visitor centre, we hiked along a well-marked path for about 2 hours through the lava field. I was surprised how varied this "moonscape" is: lots of red and brown colour tones, bizarre rock formations, and all together with a bright blue sky. When we returned from our hike, we were glad that we got up so early. The parking lot at the Roques was crowded with cars and tour buses. A few kilometres further, a side road leads to the base station of the cable car to Mount Teide. But we drove on to the northern end of the National Park without a ride to the summit. The cable car ends at an observation deck, the summit is inaccessible without permission. Approval is given only in the main office of the National Park Service in the capital Santa Cruz. We came to many more interesting places that were worth a brief stop: beautiful views of the caldera and the Teide and places where you can see endemic plants like Tenerife bugloss or broom. All in all, it was a rewarding trip to an exceptional landscape. If you are on Tenerife, you should not miss the Teide National Park. This is one of the 14th Spanish National Parks and it is located in the island of Tenerife. 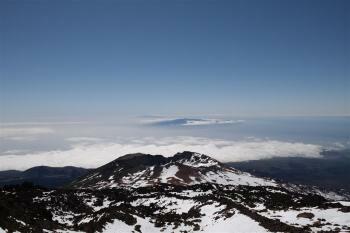 It comprises the Mount Teide, highest mountain in Spain, and some areas around it. I did not try to climb the Mount Teide till the top when I was there but it does not seem to be a very hard task. Just take into account that the summit is at almost 4000 meters therefore lack of oxygen can be a problem. You should also take into account that all the territory of the National Park is over 2000 meters high therefore weather can be quite different than in the rest of the island. Landscape in Teide National Park is vulcanic and there are some endemic plants living there. Inside the Park there is one Parador, that would be a very good choice to stay as hotels of this group are among the best and most charming ones in the country. Public transport is limited to about 1 bus per day. Organized bus tours can be taken from the coastal areas. Overall, your best bet is a rental car. The park is accessible by minor but paved roads from all sides. A public road runs from northeast to southwest across the caldera. Visual effects of Cloud, Fog and Mist: "The visual impact is emphasized by atmospheric conditions that create constantly changing textures and tones in the landscape and a ‘sea of clouds'"
Recently Active Volcanoes: 1909 from the El Chinyero vent on the Santiago (northwestern) rift. "Volcanic unrest occurred at the volcano in January 2005. Carbon dioxide emissions rose from 75 to 354 tons per day, and hydrogen sulfide emissions rose from 35 to 152 tons per day". A "Decade Volcano"
Location for a classic movie: This dramatic scenery has been featured in films such as One Million Years B.C. (1966), Clash of the Titans (2010), and Wrath of the Titans (2012). Viewable from another WHS: The entire mountain is visible from many points within Garajonay NP - most "famously" from its highest point.